You are here: Home / Topics / Hit More Line Drives / Baseball Batting Stance That Will Reduce Strikeouts? This baseball batting stance video post was sparked by my friend, whom I admire and respect as a man AND hitting instructor, doing great work in the San Diego-California area, Ryan Lehr (@thepureswingsd). He’s worked under the hitting tutelage of Reggie Smith for over 15 years, and really has a fantastic grasp of the absolutes to the swing. For those of you who don’t know Reggie Smith’s teachings, he’s as much of a ‘science-guy’ as we are. And yes, this works for fastpitch softball as well as baseball. The point of this video post, is to look at being in an athletic baseball batting stance and its effect on reducing strikeouts. Which low-K% high-ISO MLB hitters to model? Taylor Gardner, founder of the Backspin Batting Tee, says that a first baseman stretches toward the thrown ball when receiving it. Knees are bent and the eyes are getting on level plane with thrown ball and receiving glove. Gravitational Forces are acting on the ball at ALL times. Taylor Gardner came to the conclusion that a ‘rise-ball’ is a myth. And I AGREE! 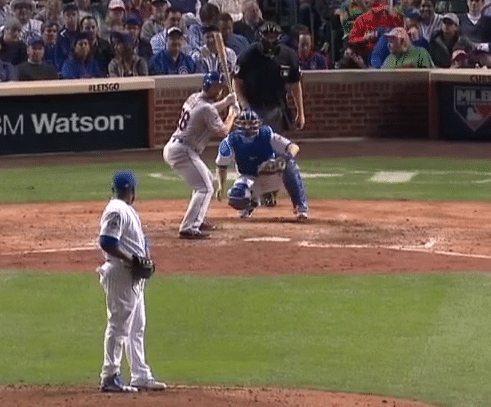 I guarantee the apex of the pitched ball’s arc will be above where it’s caught by the catcher. Sure the arc will be less, the harder the pitcher throws, but there will still be an arc nonetheless. Who Else Gets into an Athletic Position? Receiving a blazing serve from Roger Federer? CLICK HERE for Speed Coach Lee Taft (@LeeTaft) blog post on why bending the knees is important to force production. I alluded to the ‘triple flexion’ baseball batting stance in this video post breaking down Joey Votto’s swing. Votto has one of the best swings to model if you want to cut down on ground-balls, strikeouts, weak fly balls, and just want to get on base more and make more frequent solid contact. He’s the ultimate Pitch-Plane Dominator! I wanted to compare the Strikeout Percentage and ISO metrics to see if we could find a correlation between the baseball batting stance and hitters who rarely strikeout, but also maintain some element of power. One of the biggest MYTHS is that you can only be a contact hitter, or a power hitter. And that you can’t be both. Nowadays, SABERmetric people conclude that when homers go up, so does the rise of strikeouts. When looking back in time, we saw quite a few examples of fusing minimal strikeouts and raw power…Hank Aaron, Ted Williams, Joe Dimaggio, and Babe Ruth to name a few. Okay, so what is ISO? Isolated Power, according to FanGraphs.com basically describes a hitters “raw power”. Which Low Strikeout MLB Hitters to Model? If you’re the coach (or hitter) who’s goal it is to reduce strikeouts among your hitters, while also preserving some elements of power, whose swing should you model? …At least from a baseball batting stance point of view? Joc Pederson (the end of 2015 baseball batting stance version). Watch the video above for more in-depth analysis of these hitters. I’m not sure how many strikeouts Joc Pederson had without ‘triple flexion’ in 2015 versus with it, but I’m anticipating way less strikeouts for him in 2016 if he keeps this principle in his baseball batting stance. He’s a special hitter, and not a very big slugger (6’1″, 215-pounds). https://hittingperformancelab.com/wp-content/uploads/2015/12/baseball-batting-stance-daniel-murphy.png 407 491 Joey Myers https://hittingperformancelab.com/wp-content/uploads/2018/05/hitting-performance-labs_c90c0362088ef1d3d528f3078f4f8ac1.png Joey Myers2015-12-24 05:40:212018-07-23 20:50:19Baseball Batting Stance That Will Reduce Strikeouts? If you sign up on the Englishbey Hitting site,you could enhance your knowledge 10 fold.You like the science and you try hard which is a good combination. You are in a position in terms of knowledge where Steve was about a decade or so ago so there is not much sense in your trying to reinvent the wheel . One quick example would be your discussion of the rise ball and the fact that it doesn’t rise. About 10 years a guy named Scott Sarginson showed that video you described from the side . Sarah Pauly was the pitcher and he(SARGE) did the video with the pitchers father.Of course you are right that the ball doesn’t rise but you are reinventing the wheel in the same fashion as when you are talking about the stance of hitters and the value of an athletic stance.Have you seen the way Manny set up? Did he have strike out issues? As far as contact goes, your stance means a lot. If your a guy who bends alot at the knees, has low hands at launch and tilts the spine, you better lay off the high pitches. I have not seen a hitter with those three traits that can hit waist high fastballs. On the other hand, guys that have vertical spine angles and high hands and less knee bend usually hit higher pitches better. Kyle, great breakdown! I know we talked about a few of these hitters in a past post, but it’s awesome to get other examples and see the relationships between batting stance and hand positioning that can be a strength, but also a weakness in the swing. Bravo! Statistical evidence can be contaminated in baseball hitting by other factors as well, which makes them even harder to analyze. For instance … Does the player take a lot of called strikes? Does he swing at pitches out of the strike zone? If a player gets frozen on two strikes (routinely takes the first pitch even if it’s a juicey one), or swings at pitches in the dirt … his strike out rate will look worse. Coaching, attitude, etc have a lot to do with that type of strike out. Right on Bob! I knew when writing this post that I was using a loose interpretation. But I wanted to open Pandora’s Box and see what was inside. I totally agree with though. Reinventing the wheel! Really! Are suggesting Englishbey invented all what he teaches… To start I seen some of Englishbey teaching and I don’t agree with all he teaches but that besides the point. Also Some people known about the rising ball years ago and even decades ago…I’ve been following Joey for awhile now and Joey does a real great job on teaching and informing the public about the baseball swing…Joey opens the door to discussion and learning… Plugging another name and downplaying the teachings in this video does nothing to add to the discussion. Reinventing the wheel!!! Are you serious!!!! I say we only talk baseball and if you can’t add to the discussion, than what are doing here? Djura, thanks for your support. I was going to respond to Larry, but you put into words what I was going to say. It’s very rare to find anything original nowadays. Most of what we learn has been re-packaged from others. I’ll be the first to admit, my strength isn’t originality, it’s repurposing content. What’s wrong with standing on the shoulders of giants? The truth will come out in analyzing different hitters, comparing their metrics, and seeing if the aggregate of information tells the real story. Manny Ramirez stood taller, and according to FanGraphs (http://gohpl.com/1Pn32cu) had an average K% of 18.5% over 20 years. That puts him between ‘average’ and ‘above average’ on the K% rating chart. His over 20-year average ISO is .273…amazing! He’s above ‘excellent’ on the ISO ranking chart. Like with everything in this world, there will surely be exceptions to the rule. But what I’m interested in are what kind of patterns the numbers reveal to us. Does how a player stands in the box affect his/her strikeouts? Batting average? Fly-ball/line-drive/ground-ball percentages? We have enough metrics, technology, and access to smart people out there, let’s find answers, and not smother creativity. Great observation Djura! The more I look at hitting, the more it becomes a group effort by ALL disciplines: math, physics, psychology, biomechanics, engineering, biology, chemistry (nutrition), etc. The Japanese seemed to have controlled the math variable. They aren’t as obsessed with power like we are here. Their focus seems to be on harmony and balance. But I may be wrong. As always, thanks for sharing!